Shake up your routine with this Easy Pork in Onion & Chive Sauce recipe. 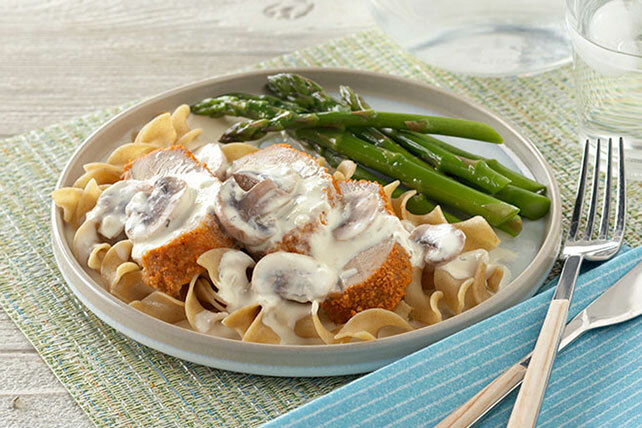 Our Easy Pork in Onion & Chive Sauce is complemented by a side of fresh asparagus. Coat meat with coating mix; place in shallow foil-lined pan. Bake 30 min. or until done (145ºF), cooking noodles in unsalted water as directed on package for the last 15 min. of the meat baking time. Meanwhile, steam asparagus 6 min. or until crisp-tender. While asparagus is cooking, heat oil in medium skillet on medium-high heat. Add mushrooms; cook 5 min., stirring occasionally. Add cream cheese spread and broth; cook 2 min. or until cream cheese is melted and sauce is well blended, stirring frequently. Remove meat from oven. Let stand 3 min. Drain noodles and asparagus. Slice meat. Top noodles with meat, then sauce. Serve with asparagus. Prepare using your favorite flavor of PHILADELPHIA 1/3 Less Fat than Cream Cheese Spread.